Who can and will be talking to their technology? Quite a few people will, though it is hard to get a real number – which is ironic, since Amazon, Google, Apple, Samsung, etc. all know how many they have shipped. And they also know how many devices are back-ordered. Maybe believe this one: could there be 50 million smart speakers in US possibly with some homes having more than one)? 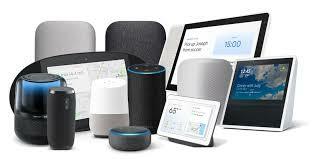 On the other hand, according to Pew Research, only 66% of the 65+ population (46 million) have broadband access(that is, high enough speed) to enable a smart speaker in the home. Perhaps non-users are in rural areas. Or they live in parts of regions, according to Microsoft, that are significantly overstated by the FCC as having broadband. Which device/software will they ask and why? For many simple interactions, there is almost no difference in capability between Amazon and Google offerings. Some could query Google Assistant on smartphones or in their cars with Apple CarPlay (via Siri) or Android Auto. With these tools, drivers can have text messages read aloud in the car and dictate the response. According to testing, Google Assistant may be smarter. So for some uses, out and about with cars and smartphones, that may be more optimal – especially with recent new features for maps. Back in the home, it is feasible to have an established, if often misunderstood, and possibly, even absurd continuing dialogue with smart speakers. We can wander around requesting streaming radio stations, now possible with devices that are in multiple rooms all playing the same song if you’re crazy enough to want that. There is no going back – the genie is out of the bottle. There are some concerns – though privacy invasions are not, according to experts, as worrisome as data theft from hotel or credit bureau sites. Older adults and those who serve them may worry having an always-listening device in a senior’s home, ready instantly to misunderstand commands, and possibly screw up the response with actions or accidental purchases. Perhaps tapping the microphone off on a nearby smart speaker while watching TV (commercials) should become standard practice. Checking out a report on smart speaker usage categories, though, people apparently are NOT using them to purchase goods. Whew, that's a relief. Who is NOT going to enable a voice first interface? That answer is simple. If it can be enabled (one way or the other), it will be, even in the health provider/insurer segment, where the experiments are numerous and sometimes silly. But we know that doctors hate interacting with EHRs. We know that voice assistants will migrate further into the health ecosystem. We can see that the experiment phase will come to an end, and voice interactions will support personalized information exchange – your HIPAA-compliant answer to ‘when is my next appointment, for what and with whom?’ If the slow-to-change senior living industry sees the opportunity to improve service and operations with voice first technology, what is NOT possible? NOTE: Upcoming conferences – will you be there to meet in person? Permalink Submitted by John Boden (not verified) on Fri, 12/07/2018 - 09:52. My biggest issue is not with what the device is saying, but with what it is hearing. Then who is attached to it out there in cyber space. If I sneeze will it know that my tissue inventory is low and automatically ship me more? No thanks, I will keep control of when what I have to say is available to others.